Dee and Dennis Gregory from Tennessee are white oak basketmakers and prolific teachers. Not only do they make beautiful baskets, but they also make wonder weaving kits. I purchased these awhile back and finally found time to make them. Now I have to say at best all I can claim is to have woven these baskets as all the ribs were already in place so all I had to do was finish weaving over/under to fill in the space. That is not to say it wasn't fun working on these as I so rarely get to use white oak. 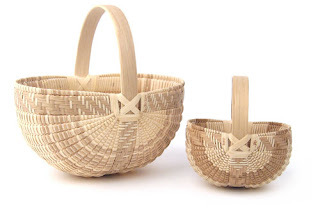 With white oak basketry having such a long tradition here in Missouri I feel badly that I haven't explored it more. As with so many things, "maybe someday, when I have some free time." Both of the baskets I would call "melon" shaped in stead of buttocks or gizzard as many white oak ribbed baskets are since they don't have the bulbous shaped sides. The darker stripes in the baskets are from the naturally darker heartwood of the tree with the lighter weavers from the sapwood. Over time as the baskets darken the difference in color will become less and less noticeable, but it will be years before they get that kind of patina. The smaller of the two baskets measures about 4" in diameter and now hangs on the basket tree in my weaving room. The other oval shaped baskets measures about 7"x5" and hands from a peg board over my picture window. Your "melon baskets" are stunning. I am relatively new to weaving and have not attempted to weave this style basket yet. I think that seeing all the ribs in place might allow me the perfect opportunity to figure out the technique. Hmmm... I'm thinking I just maight have to order a kit! These baskets are relatively small and the ribs are pretty close together. If you haven't woven a ribbed basket before you are probably going to be frustrated starting with one of these, though Dee and Dennis do teach these at conventions, so maybe not. It may have just been that my big man hands didn't fit into the smaller 4" basket. My recommendation though would be to learn in inexpensive reed and then try the relatively expensive white oak when you are comfortable. Don't be frightened or intimidated by ribbed baskets. They are one of my favorite styles, though I don't make them very often anymore. Thanks for the advice, Tony. You're right... I think I'll attempt this basket style with reed I have on hand, some hoops, and a pattern from Lyn Syler :-) This could have turned into an expensive and frustrating weaving mission! I used to buy baskets from Dee & Dennis years ago when they were living in KY. Then everyone caught on to their incredible talent. I'm curious what conventions/shows they attend and also, who sells their basket kits? Thanks so much.